OK, you’ve waited patiently for Comet ISON to brighten and reappear in the dawn sky. It has. Now you’re chomping at the bit for a look at it in your telescope. Before you set the alarm and venture into the night, let’s prepare for what to expect. The better you know your target, the easier it will be to find. The latest brightness estimates from the amateur comet community place ISON around magnitude 13, bright enough to be within reach of 10-inch (25 cm) and larger telescopes. Alan Hale of Arizona, co-discover of Comet Hale-Bopp, was one of the first to see it. Through his 16-inch (41 cm) reflecting telescope on September 1, he noted the comet as a small object about 0.6 arc minutes across (1 arc minute = 1/30 the diameter of the full moon), brighter in the center and shining faintly at magnitude 13.1. Picture a small, dim patch of glowing mist and you’ve got the picture. Hale’s observing conditions were excellent though he did have to contend with light from the nearby crescent moon. Starting tomorrow morning, the moon will finally be out of the picture. A sharp-eyed observer under the best skies would expect to see a fuzzy object this faint in a telescope as small as 8-inches (20 cm). Most of us will need something a little bigger. A 10-12 incher (25-30 cm) should do the trick until the comet swells into the 11-12 magnitude range. But you’ll need more than a hefty scope. Key to spotting ISON are good charts, a steady atmosphere for sharp images (shaky air blurs faint objects into invisibility) and catching the comet at the right time. I also encourage you to use averted vision, a great technique for spotting faint sky objects. Instead of staring directly at the comet, look off to the side of its position. That way you allow the comet’s feeble photons to flood your eye’s rod cells, those most sensitive to dim light. While it now rises around 3-3:30 a.m. local time, you’ll get your best – or only – view once ISON has cleared the light-sucking thick air and haze so common near the horizon. The optimum viewing time occurs shortly before the start of morning twilight when the comet will be about 15 degrees high in the northeastern sky. At mid-northern latitudes,where twilight begins about 1.5 hours before sunrise, that’s around 5 a.m. Did I mention you’d lose a few hours sleep in your pursuit? Lucky for us comet hunters, ISON’s location is easy to find only a few degrees east of the 1st magnitude planet Mars and about 2 degrees north of the familiar Beehive Cluster or M44. The first map shows the general view to get you oriented. 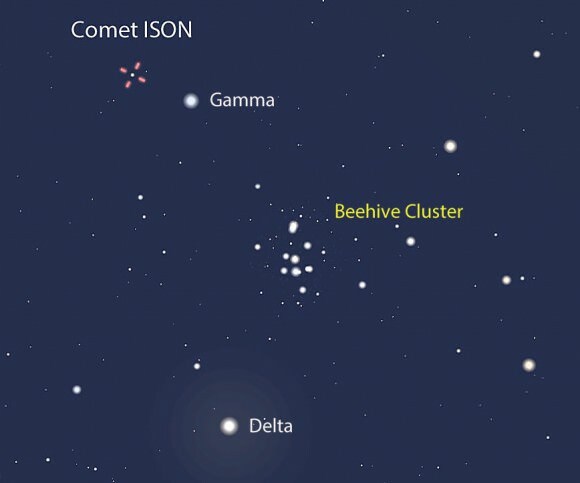 The second takes us in closer to show the comet’s relation to the Beehive Cluster, and the third provides a detailed telescopic view with stars plotted to about 12th magnitude. The comet positions on the detailed map are plotted for 5 a.m. CDT. Since ISON moves relatively slowly, those positions will be accurate for a time zone or two either way. If you live significantly farther east or west of the U.S. Central Time Zone, you can interpolate between the tick marks. It’s good news for skywatchers from here on out as ISON continues to brighten and rise higher in the east with each passing night. A month from now, it should be visible in scopes as small as 6-inches (15 cm). Good luck in your comet quest!